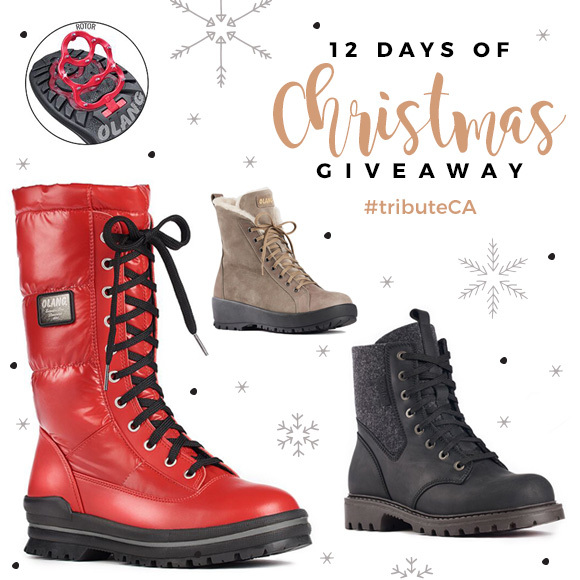 For today’s Christmas giveaway we have a beautiful pair of boots from Olang boots. The feature that makes Olang unique is the special grip at the bottom that makes it ideal for Canadian winters. How cool is that? We are giving away a pair of boots of your choice -- women’s, men’s or children's boots. The average price of these swanky boots ranges between $150 CDN to $250 CDN. To win this fantastic prize, write your full name below and tell us what is your favorite style of Olang boots? The winner is Brian Hwang! The Fredo looks rather stylish. LUNA and BAMBOO are my choice. I'll opt for Luna. The Pomona are really nice &amp; warm looking, and would go perfectly with my coat! "Olang" boots are off-the-charts amazing. I choose the "Sound" style for its retro look, colours and versatility. It's an absolute stunner. This boot can go from jeans to dresses and everything in between. You're sure to stand out in a crowd with these chic boots. Christina Cichon My favorite style of Olang boots is The Pomona. OMG I just adore the MARA boot in black! Thanks! Happy Holidays! I love Sound, it's beautiful! Oooh, I love the Silvia - looks like it would be great for walking my rescue dog this winter! My favorite style of Olang boots would be SOUND and LOVE the red colour. OMG built in swiveling &amp; folding ice cleats!!! How cool are these boots. Deborah Ann Peever I really love the Marilyn Olang Boots! The Barbara is my fave! My favorite Olang boot style is the Alabama. I like the style and colour of the Luna boot. The MARA are my favourite! looove these. especially the Kursk style ! I love the short boots! Sound in purple!! or Venere. So cute!! Sorry, Liisa Stover wants the Purple Sounds!! I like the Bamboo in red with black polka dots. Those boots really caught my eyes! Fave is Glamour, with Sound a close second! I am absolutely loving the Venere!! My favourite pair would be Alabama. I like the Domingo style. I love the women's Bamboo boot, so cute and comfy. I live in northern Ontario where it snows like 90% of the year :0 So I like the idea that these boots are extra grippy. I really like the Sound women's style. The purple boots are extra fab. I love the Glamour boots! I would love to win the DADA boot.It would be the most versatile for me. The Men's Domingo looks pretty cool ! I think Silvia looks like a very nice boot! Would love this for the Winter weather! I like the BARBARA style! WOW, they are all Wonderful !!! Venere. Love the style of it! So many pretty boots. My favorite are the ACACIA models. I love the Greta in black! I really could use a new pair of winter boots and these would be just perfect!! I love the Ritma in red! Monica is for me!I have super wide feet and they look like they would fit me! The Alabama, they'd keep me nice and warm on those long winter hikes! And I'd look good to boot ha ha. My favorite style of Olang boots are ones to call my own! Theyâ€™re gorgeous, especially the Glamour style! I like the Glamour in Black. Just knowing I will be safe because of the Olang unique design with the grip on the soles is everything! I love, love the Futura! The Barbara boots are awesome! I love the Olang boots. Always wanted a short pair with the fur lining. Luna...or Sienna cause that is my kids name:) thank you for the chance. The Barbara, size 7, please and thanks! I like the Kiev boots for men. The Greta, I love getting out on cold Winter days with my camera to take awesome pictures of our beautiful nature that we are surrounded by and these boots would keep me warm and provide good grip so I don't take any spills! Oh yeah, and today is my BIRTHDAY so these would make an AMAZING Birthday Gift! Luna is my favourite in black. I love the Pomona boots! The Alabama is my fave and will keep my feet toasty up to -30Â°C ! Perfect for our cold Canadian winters! Love the Domingo and the Fredo! Silvia is my favourite style of Olang boots. My favorite style of the Olang boots is Greta. I really love them in any color. I like many of the Olang styles , but the Ritma rocks !! I like the Barbara style boot - they are nice to look at and look extremely warm as well which is what I need as I spend every weekend at the rink with my kids, brrrr!! Of all of the Olang boots I could pick the Kursk looks like it would do me great. Plus, those cold winters in Winnipeg my feet would thank me. Lovin' the Glamour. Time to rock some red boots! Merry Chhristmas, thanks for the giveaway! Pauline Lafrance Montague. I love the Ziller OC TEX with grips. Oooo I love them all but if I had to pick it would be pop or Charlotte. I love the Glamour boots they are awesome looking and would be great for surviving the Canadian winters! I like the Futura style! It's a tough choice - I like both Sound and Greta! I like the Fredo style. I love them all but Glamour is my favourite. My favorite style has got to be "Pop"
My favourite it the Adele. I love the Pomona boot! Barbara, Monica and Venere are amazing! But I love the Pomona! Love the Magna. Very stylish and look so comfy!! I like Glamour and Venere :) Thanks! I like the Pomona the best! I don't really have a favorite one as I like the look of all 3. I like the SIENNA. They look so cozy and warm. The blog ones look cool! I LOVE LOVE LOVE the BAMBOO Style of OLANG BOOTS!! I love the red high boots!!! I love the red high boots!!! stunning!! I love the men's Alabama Boots. I'm really liking the looks of Glamour and Sound in the Women's collection! I really think the ZAIDE has an amazing design to them. Would love to get the Domingo as a gift for my older son. I like the Barbara style ones for women. the 'sound' in purple....to match my hair! I like the Luna or the Kiev boot. I would love to win a pair of Olang boots for my 7 yr. old great granddaughter. They look terrific and would be nice and warm for her. LOVE the Domingo style boots! the Women's Dada would work perfectly for me! It's so hard to choose, lots that I like. To choose just one I would say I really like the Vermont! I like those tall ones. They look VERY classy. I love the Blog boot! The women's Blog boots in black are my fav! The Glamour boot for sure! Oh man I love the glamour, magda, Venere, Futura....but my favorite right now would be the Magna!!! I like the BARBARA style for women! I love both the Dada and Mara!! I love tall boots but have issues finding ones that fit my calves, so I would pick the classic look of the Adele. I really like the Grace boot. I like the Nora boot! I like the Gema with the front zipper for a longer boot and the Luna for a shorter one. They all look fantastic! Thank you!. https://olangcanada.com/en/produits/barbara/ I love the Barbara boots thanks for this amazing giveaway! I like the Zaide boots! Glamour looks fashionable yet functional. Love the red color! Ohh!I would love a pair of GLAMOUR booths in black! I like the Blog. I hate wearing heavy boots and always prefer running shoes but of course they get wet!! These look great. The CHARLOTTE is my choice. I like the ankle high ladies ones. I love the look of the Acacia. My favourite style is Pomona in a light brown colour. Silvia because they are in style and comfortable!! I love the "Sound" boots! The short black are the BOOM! I love the boots, I think they would be great to wear this winter. I especially love the red boots. They look wonderful. The sound boots are amazing! So stylish. Zaide Women's love! love! love! I think that the Venere are so cute! I love the Pomona style for women! So stylish! I love the Women's Venere. Stylish and practical. Super cute! I love the Zaide and Futura!...and many more! My pick would be POMONA in black. the Luna in red, adorable and looks very warm! I am in LOVE with the red RITMO ladies boots!!! I wish I had these a few years ago before I slipped on the ice and broke my ankle. These boots are amazing!!! I am loving the red Dada's!!! They would go beautifully with my new red winter coat!! Hard to choose! I might go with Monica or Gemma. My fav is the POMONA. Looks so cozy. The LUNA boots are beautiful! I LOVE those red boots! !! The Tatra look perfect for me! I love the look of "Bamboo" boot in black! The Greta boots are my favourite. The Domingo would be my choice. Love the Ritmo in black. Just my style! Loving the men's Domingo boots. Love the Kursk for men. I like the Monica style ones because they zip up. Colleen Anspach - I would like to give your Nebraska boots as the perfect gift. I like a few but my favourite is Ziller! I love the Glamour boots!! Olang, bright and cheerful when it is cold and miserable outside! My favourite style of Olang Boots are the Magda Boots. They look great for hiking in the winter, and very warm! I looove Venere!ðŸ˜ ty for the chance! I love the Dada in black. I love the Red Bamboo boots. I've always wanted a pair of Olang boots. They look like they'd be amazing. My favourite style is DADA. Well the Charlotte of course!! I'm really liking the Domingos! I prefer the low cut; easier to put on. I do so need a pair of winter boots! My favourite style of Olang for Women is the Monica in grey! I like the Olang POP. I love the Zaide so pretty! I like the women's Ziller boot.. need something tall. I love the Ritmo in red. My favourite style is the Barbara. RITMO are my favs... in bright red!! The red Bamboo are adorable! I absolutely love any kind of boot but I like the Sylvia boot!! Those Adele's look great - Love the pivot on the sole as well! My fave style is the Acacia Boot. Glamour, Luna and Gemma are my favorites! My favourite style of Olang boots is VENERE! The ZAID looks cool and functional! I love the Sound boot in red. I can honestly say it is the first winter boot that makes me want to go dancing!! The Alabama is my favourite boot. It will keep my feet warm up to -30Â°C which makes it perfect for winters in Ottawa! The shorter boots are my preference. These boots look so perfect for our winter conditions in Winnipeg! Someone had a great idea!! My favourites are the Adele and Greta! I need/want have to have the pomona!! Happy holidays to everyone! I actually can't decide. Maybe the Futura as it looks like it could be both a tall and roll down to a shorter boot. I love the Vermont Boots! I love the beige pair. they look so comfy !! My favourite Olang boot is the Glamour. All are beautiful and the grip on the bottom is such a great idea. Wonderful giveaway, thank you. Would love a pair of the Marilyn style! Merry Christmas! I like the Luna boots - for the ease of getting them on (in a hurry when the dog needs out) and for the variety of colours. I like "BARBARA". it will be perfect for this winter. I love the Adele! Fashionable everyday wear! A pair of Adele Boots would be just right for me! I need ones with a side zipper for easy access as I have bunions and it is hard to get my foot in some boots! I love the MAGDA style. I love the tall red boots! Thanks for this contest Tribute! Definitely, the Venere! If these boots help me not slip anymore, I will be forever grateful!! Is it possible to be beautiful and fonctionnal?! Holy crow - these are ADORABLE! I had never heard of Olang before this - I can't believe it, some of the styles are really fashionable and cute! I have big ole calves, lol, so I need something adjustable. The Nora, or maybe the Lucy? The Lucy is my favorite. My favorite Olang style is Bamboo. Its so cute! The Alabama boots look great! Adele! They have laces and a zipper! I love the pivoting grip. Super cool and useful. I live the Magna and the Barbara boots the best. Hard to choose. Thanks for hosting this great contest. #12DaysofChristmas. #TributeCA. #Olong. Glamour and Dada look amazing! I like the Nebraska boots! I love the Glamour boots. Love them in red! Tiff Cho and I really love the Marilyn Olang Boots! I love the Venere boots!! The Maras are so nice ! I would love to rock these all season long ! My favourite boot style is Sound but, I also love Luna, Gemma and Pop. So many to choose from. Thank you for the chance to win a pair of these amazing boots. Love the Ladies Bamboo in Red!! I'm in love with the Purple "Sound" boots! I'm so sick of black boots, this would be an awesome funky change for Canadian Winter! They look nice and warm too! I think I would prefer the Luna or Adele. They all look beautiful. Perhaps I would not kiss the ground as often in the winter if I had these boots! wow a hard decision I guess the Sound style!!!! I love all the styles, so to pick out just one might hurt the other ones feelings. Love these boots! The Sound and Dada are my favourites. The Zaide for sure. Perfect for Vancouver winters! The Pomona is my favourite! I would love to win a pair of Alabama Olang boots for my son in university. He is living in Ottawa and there is always a ton of snow there, he informed me his boots have a hole and is looking for a new pair at Christmas. Thank you and Merry Christmas to All! it's so hard to choose, i like all of them! Melodie Cloutier and I love the Venere boots!! I love them all I would take any pair!! Anita Gullo and I like the Blog best! Ohh, so stylish. I don't think i can pick a favorite! I love those red boots oh My!! acacia boots because they are rated at -30! The Bamboo boots in grey are my favourite. I like the Women's Monica boots. I love the SOUND Style! I need new winter boots, and the style VENERE looks comfy, cozy and easy on the feet! I am partial to the Barbara and the Mara...tough choice...you choose for me! My favourite boots are the Adele Olang boots. I really like the Kiev style boot from Olang. Love the special grip on them. I love the Marilyn boots, so comfy and stylish! Zaird are my favorite ones. I really like the tan Pomona boot. It looks super comfy and warm. I like the style of the Olang MAGDA NERO. I like the ALABAMA style boot. Wow, these would be fantastic for winter hiking while carrying the little one in the baby carrier. No need to bend over to put on over the boot spikes! I personally like the Kursk style! Oh ! Decisions decisions...Glamour for me ! I love the long boot style of Olang footwear! Beautiful looking boots! Love the long style of Olangâ€™s footwear! I like the Gemma boot. Its a bit taller and has the ease of a front zipper. The Silvia, Nora and Acacia are all beautiful! I like the Kiev, but a taller one might be better..hmmm so many great options. I like the Adele style. Alabama are my favourite boots from Olang for Men. I love the Adele in the ladies!! My favourite ladies boot is the Barbara style or maybe the Acacia? So hard to choose! My fave style is the Ziller. Loving the Glamour in red! I like the Domingo boots from Olang for Men. I'm old and don't like to fall! bamboo, sound, or pomona. Im really liking the red! My favorite style is Glamour. Love the Olang. Cmon Santa! I love the Glamour boots. Thanks for the opportunity. I love the Olang Silvia boots. I really like the Marilyn or the Venere style!! Love the Greta Style Boot.Bet they would keep my feet warm. I love many of the styles - but if I had to pick only one it would be Ritmo (in red). Donâ€™t know never owned a pair but would love to win! Wendy Post I love the Bamboo or the Sound boots, especially in red! I like the Domingo because of the spiked soles and the extra waterproofing feature. My favourite boot is Lucy! I love love love the Red Glamour! They look amazing! So stylish and comfortable! Would love to own a pair! Thanks! I love the red boots! They sure look nice! Either Luna or Adele! So many choices, hard to pick just one. Thanks for the chance at new boots, sure could use a new pair! I am taken with the DADA style in red. Lovely. #TributeCA #Olang My choice would be Zaide for sure. Love all the styles. I love the SOUND ones, in any colour! I like the POMONA boots. I like sound, glamour or bamboo style Olang boots. I love the Greta boots!! Thanks for the chance to win!! I like the Acacia womans boots. My favourite style is Magda. I like the Grace in black. Thanks. The Bamboo shoe is cute and I bet it's comfy too. I like the Zaide boots. My favourite style is Sound. I love the Sound in Red colour- they look so comfortable and warm and stylish!! Thanks for the contest....and Happy Holiday!! Those brown ones at the back are gorgeous! I like the style of the Domingo boots!! I like the Greta boot. My favourite style of Olang boots is Charlotte. I like the Greta style! Venere is so beautiful &amp; practical! I like the "Bamboo" style! My favourite style of Olang boots is the Zaide style in women's. I love the Sound ladies red boot! Gorgeous styles! I love the Dada especially in red. I love the Magda pair! My favourite pair is the Barbara. My favourite style is Pop. I Like the GLAMOUR boot. I love those Greta boots! I like the Kiev, no laces, easy peasy! I like the KURSK boots. I like the bamboo women's style. That would be my choice. My favourite are the kid's Patty in gray. I love the Womenâ€™s Blog! The MONICA is my favourite, it looks very warm. Love the Glamour in Red. Olang is perfect for me! I love my red Monikas! My daughter would love a pair of Gretas. I like Ritmo. They look so comfortable. I like the Pop boots. I'm loving the Adele boots-warm and comfy too. I just love the "Barbara" they look so comfy and warm! My name is Amy Stackhouse and I want the women's style "Monica"
I love the dada style! My favorite style of Olang boots is Glamour! I like Barbara the best - looks very warm and comfy. My favorite style of Olang boots is Luna! Domingo is my favourite style. I love the Sound Purple boots. I love the Greta boots!!! OMG!!!! I love the bamboo boots. Ooo but also the purple sound boots. I like a higher boot since I use public transportation and sometime the wait for the bus is long. I loooove the Luna boots! My favorite style of Olang boots is The Pomona. The tall red ones are just too dreamy!! I love the ADELE boot! Fit is everything, but without having the benefit of trying them on, I like the Women's 'Monica' style best. I love the glamour boot ! The Pomona or Nora are fantastic, I love them. I love the Glamour boots. My favourite is the POMONA in red. I would LOVE to win The Fredo Boots for my son. They are very much needed. Thanks for the chance Tribute.ca ðŸ˜Š. I love the Domingo boots. I love both the DADA and MARA - in red. I love these boots. They would be most welcome since my old ones are on their way out! I love the Glamour boot. Beautiful boots but Glamour is my favorite. I like the ladies Olang boots DADA in black. I love the Sienna Boot!! I like the Greta in grey! I like the Fredo boot!! I like their MONICA womens boot best especially in the grey. Blog looks awesome! Love it. I like the Mara olang boots in Red! So cute! I would choose the Fredo, good looking boot. Wow, all of the Olang boots are gorgeous but Sienna is my favourite! They look so stylish and would be perfect to wear in Vancouver this winter! I love the sound pair of boots in purple. I like the Dada style. Love the heel and soft toe of the Venere. The Gemma boot in Red. Very practical and nice looking. There are so many lovely styles to choose from, I really like Greta in Grey for everyday or the Venere to keep me warm and cozy and a little bit snazzy - Thank you for the amazing chance at this wonderful giveaway. The Luna is my favourite! I love the Marilyn style. I absolutely love the Greta boots! The Mara is just my style. My favourite is Olang " Sound " ! Beautiful boots ! My favourite styles are the 'Glamour', 'Sound' and 'Dada' boots. These boots mean business; they're ready to kick life up a notch. I'd be thrilled to win a pair! My favorite style of Olang boots is the Futura boots. I like the style and look of the of the Magda. Love the Dada boot, gorgeous! I love the black venere pleaSe!!! If I can choose any pair of boots on the Olang website I would choose the Charlotte in black. The Soles have stainless steel spikes designed to increase grip on snow and ice The boots have side zippers which are better because front zippers aren't very flexible. I don't have time for knee high laces. I love the Domingo boots. They have a nice rugged look. Merry Christmas! Maybe you can put the Domingo boots under my tree. I really like the Dada red boots. They look easy to put on &amp; would go well with any pair of pants, which I prefer wearing during the winter months. Merry Christmas to all! My favourite style is definitely the Women's Adele! Love them and they look warm too! Thanks. It was difficult to pick my favourite pair of boots on the Olang website. But I would choose the Kiev boots. The Glamor style is really cute and my favorite! I honestly love them all so it would be hard to choose - maybe the Acacia, but Iâ€™d be happy with any pair. Thank you!!! The Fredo boot for me. Love the shorter boots ! The grip on the underside of the boot is a great feature! I love the women's Monica boots. These boots are so smart with the built in traction for ice. Thanks for the contest! I love the Women's Luna Boots! I like the look of the Domingo. I like the Olang....very classy. The Dada looks awesome. love it! My name is Laurent Latulippe and I like the "Alabama" boots. I like the Mara boot. My husband realized when he put his boots on the other day they had a hole in them (cause puppy) so he likes the "SLAVA" he needs them more than I do but I do really like the "MONICA" as it has a zipper easy for me when taking the dogs out. Love the Greta -I walk a lot in the winter and these would be great! I really like the Greta in black! The Mara boots are amazing! Love!!!! I love the Magda boots! I really like the "Glamour"
My favorite style is the "Glamour." Great for Montreal winters! Domingo is to my taste! I find "Alabama" really comfortable! I love the tall red boots. They'll see me coming! Sound in the lavender just gorgeous!! I like the style called Grace, the zippers make them so easy to put on. Tall enough for heavy snow. I like the Glamour style in red. I like the Glamour in red. I love love love the VENERE boots!! First, thank you for the chance to win this awesome prize of a pair of Olang boots. If I should be so lucky as to win, it will be hard to choose which pair I want! There are a lot of styles I really like, such as the Zaide, Barbara, Nora, Greta,&amp; Grace, but I think my favourite style of Olang boots is the ADELE. Happy Holidays! I love the Glamour in red. like the Sienna they are my choice. Any style will do - prefer a tall boot but sometimes hard to get foot in (have a high arch)boot!.... would just like to win a pair! I'd pick the Domingo. Thanks! GRETA in brown is my favourite! I LOVE the Futura! Thanks! I like the Greta boots! I love the sound red boots. They are stylish warm and high up boots for when there is snow . My favorite style of Olang boots is MONICA . My favorite style of Olang boots is ADELE . I like the Barbara, looks so cozy and warm. My favorite style of Olang boots is POMONA . I hadn't heard of these boots before so I had to check them out on their website! I love the Bamboo in red! They just look like a lot of fun! The Mara boots are my favourite! I love DADA in red. Hard decision. Have narrowed down to 2. Adele and Greta. LOVE the black boots - they are really cute - red ones too are really nice. Would LOVE to win any of these boots! Would be a wonderful Christmas present! I like the Pop boot! the Olang boots look great thanks! I like the Alabama model. I love the grace please! I like the sound version in red. Greta, in black, for sure! I really like the Monica! I love the 'Mara'. They look super warm &amp; I love the grey colour! I love them all because I'm a boot freak! Orang makes a good statement! I love the Sound boots. Great line! So many nice choices, but I think I would choose the Sylvia. My favorite style of Olang boots are the Domingo. My favorite boots are the tall cognac coloured ones. I love the Mara women's boot. I love, love, love red boots - Sound,Luna and Ritmo are my favs. Thanks for the contest. Grace or Magda but they are alll awesome!! Glamour! They look edgy and warm! I like the Barbara model. I love the red DADA boots! My favourite Olang Boot is Glamour! Definitely Glamour especially in red! I'm in love with the Acacia boots! Thanks for the contest! My favorite style of Olang boots is ankle. The Pomona boot looks like it could work rather well here in Saskatchewan. I absolutely LOVE the Bamboo! It is so fun and funky! I love the Luna boot!!! I love the Mara boots. Look great, warm, easy to put on. My son would look sharp in the Tatra! choose one - way too hard but if you are making me so - the Greta! I like Bamboo - warm, comfortable and stylish! I love the Nora boot! Fredo for hubby. He could use a new pair! Glamour is nice for my wife! The Grip-On system would be wonderful for walking the dog in winter! My fave style of Olang boot is the Bamboo in black. I love the short boot so cute and versatile!!!! I like the Fredo as it looks rather stylish. The think the Dada looks very trendy and stylish. They are all pretty amazing. It would depend on how the boot fits on my calves. Sound in red! Omgosh - Who doesn't need a pair of beautiful boots in their life? I love these! I like the tall style as well. Super stylish. Anything tall for me! As long as it's stylish and comfy then I'm okay with absolutely anything! I'll be honest, until I saw this contest banner, I haven't heard of Olang Boots. But I looked at your site then, and only because I don't have the experience of even trying them on yet, I can certainly see me having probably more than one favourite. They look fantastic and I love the many of the styles and colours. This would be a great opportunity to get a pair to really wear and enjoy, while getting to try some on to make that choice a reality. Thanks for this contest chance! To be honest I have never owned Olang boots before, love to win a pairs so I can tell people about it! I need waterproof boots! My favourite Olang - FREDO boots. I like the Dada for a good pant boot. If I won I would pick out nice warm boots for my husband. He is the one that does our snowblowing and even helps out a couple of our neighbours. The DADA style looks great! My favorite style of Olang Boots is Domingo. Olang has several styles I like. The red Gemma! Slava. I like the shoestring holder thingies. I like the mid-sized that can keep my feet toasty warm during the bitter cold winter days.